Our Chow Chow bit my dad, what do i do? Help please! I have a Chow Chow, born December 2012 (8 months), his name is Chowder. We got him as a gift on my birthday which was February 18. Chowder is a very cute dog, I've owned a Chow Chow before with my family but this was the first time me and my girlfriend had one. A while ago when we came home we just heard the bad news that Chowder bit my girlfriend's dad. What happened was they had a visitor sleeping in the guest room, Chowder saw the unfamiliar visitor and growled at him and attempted to jump on the bed to reach the guest (but he couldnt). The dad, knowing that Chowder has been a good boy ever since the first day he was here, thought it was safe to use his hands to block chowder from the guest. That's when chowder bit his hand. This was the first time Chowder bit someone with the intention to hurt, other times he'd bite is just to play and nibble. We were all shocked, especially me and my girlfriend since we're the owner. But it didn't stop there, after an hour or two when we got home, our cousin (the guest who chowder attempted to attack) just got back home and Chowder was looking at him from the stairs, furious. So we tried again to make peace with chowder and our cousin, we slowly let our cousin go up the stairs to say hi to chowder and formally introduce the two. We thought that chowder would be more calm this time around because me and my girlfriend were there and he usually behaves when we're there, but we were wrong. I put my hands on chowder's head in an attempt to calm him down, stroked his back and said "it's okay, he's a friend", what he did was he turned to my hand, growled, and attempted to bite me. My girlfriend saw this and tried to hold him too, same result, chowder growled and attempted to bite her hand. So now i really dont know how to approach this dog, we've been with him for 7 months and we were really heartbroken to see him bite us. We already consider him a part of our family and the last thing i want to do is to send this dog away. What do i do from here? Re: Our Chow Chow bit my dad, what do i do? Help please! You may have to seek the help of a professional on how to properly work with him on this problem. A couple things I see, is you should never reach a hand in when he is in this state...he is not recognizing friend from foe, all he is seeing is is a threat and he wants to make that go away. Also you are telling him while stroking, "It's ok." Though you mean it to sooth and calm him, it is telling him "It's ok to protect." It is better to say nothing, and just quietly take control [perhaps a leash all ready on him, to grab end so you don't get bit] and move away, rather than to comfort a dog in this state. Now saying that, growling is a warning system that shouldn't be shut down either [you don't want to comfort it, but not take it away if that makes sense]. Believe it or not, you want this. It's telling you, "I'm uncomfortable, I'm going to bite, get away!" If you take the growl away, he is just going to go to bite! Stuff like that. Having person move up closer was ignoring his warning system and putting the person in danger. When a dog growls, he's communicating exactly how he feels and what he is going to do if ignored. You may want to look into 'counter conditioning.' There is a video on youtube and I imagine there should be some info if you do a google search. This is a method to change the state of mind of your dog during things like this...negative to positive. It is important to have good timing with this method but it is helpful once you get the hang of it. And lastly, manage...be careful what situations you put him into. Again, a professional may be a good idea at this point. Anyhow I always seem to write a novel, but hopefully something helps...I am sure others will pipe in with great advice. Based on the post, he ran into an unexpected guest. He didnt expect this person to be there and went into guard mode. Then, he has someone commanding him and reaching in to slow him that is not his owner. I can't tell from the post whose home this is or who lives there. Is it your home, your girlfriends fathers home, etc, etc. Imagine Chowders confusion if we cant figure it out. Chows need a stable, established environment and consistent leadership. You have unannounced guests (to your dog) showing up inside the home. At least 3 people trying to tell the dog what is acceptable. And i agree with Apple that the timing was wrong with telling him it's OK...that needs to be done before someone enters your Chows home and any poor behavior starts. If the household cannot be more clearly defined, and leadership roles established, it is only going to get worse, not better. This is not a chow issue. Right now it is the dogs house, because nobody else has established himself. Who owns the dog and is responsible for its behavior. He needs to know this. I agree with the others that you can definately benefit from some training but I do want to add that you will need to find a positive reinforcement trainer that is comfortable working with chows otherwise you will make this worse since your Chow will trust you even less. Chows are a dominant breed. If they don't feel confidant in your leadership, they will take over and lead. Don't ever stick your hand in front of any dog behaving this way or you will be bitten. Hopefully, you will learn what sets your chow off and can head this off before it escalates but if it does escalate like this, you need to do something to break the focus so you can grab your Chow. A loud clap or quick loud yell might snap him out of hyper focusing. When two dogs are fighting, sometimes dousing them with water helps distract them for a second and break the focus and you can then interfere. One last thing, there is obviously something about your cousin that your Chow doesn't like. Chows are a pretty good judge of character. There is something about this person that is setting your Chow off. It could be as simple as your cousin is fearful (and who wouldn't be after 2 almost attacks). Chows sense fear and they react to fear with aggression. Your chow is still young and entering the "teenager" phase. If your chow isn't neutered you may want to have that done as well. Oh, and also, you may want to do a search on this site for NILF (nothing in life is free) training for your Chow. It works to help establish you are the leader. Thank you for your reply, I searched the video on youtube and the method makes sense. We will try this. And yes I agree, we are already talking about putting him on a leash. I will keep your advice in mind the next time he does this again, thanks. It's their house (dad,girlfriend,brother,mother). I completely agree with you that the leadership role needs to be established. In the current state i think Chowder is thinking that he is the alpha dog in the household, he gets spoiled intensely by the people around here. Thank you for your reply. Thank you for your reply, I will look into that NILF training method you posted. Yes I agree with you with the loud stomp. My girlfriend's brother did that and it kind of distracted him and made him walk away. I can't say thank you enough for your quick replies. I hope i can keep this thread active as possible because i want to continuously share with you chowder's progress and seek further advice from the chowchow.org community. With continuous training, i hope Chowder will be okay. Changing the way chowder roams around the house: Chowder mainly sleeps in my girlfriend's room, when he needs to pee and poo, he goes out of our room, goes inside the master's bedroom where the door to the balcony is. The problem in this way is that when we make him pee, he roams around the master's bedroom first before he goes out and pee/poo, we dont force him to go out of the balcony and pee/poo. We just wait outside the balcony door, wait for him to finish sniffing whatever he has to sniff in the master's bedroom. This is in my opinion one sign of poor leadership. In a way, we are telling chowder: "go ahead and do whatever you want, once you're ready to pee we're here outside the balcony". Strong leadership is we would put him on a leash and when he needs to go, we will lead him to the balcony to pee/poo, and after that we bring him back to the room. We don't leave the option to him. Am i correct that our old method of making him pee is a sign of poor leadership? So in short, we will dictate every movement chowder makes here in our house and it will be with a purpose to show that he is not the boss of this house. pee/poo time will be strictly going back and forth through the balcony, no more roaming around the master's bed room. Play time will be scheduled accordingly and once he's done, he will go back to our room. Every time we enter a room, we will go first with him following behind us. Taking off the leash was a big mistake since it is a tool to communicate to him that he is not the boss. 2.) Socialization - We really haven't brought chowder out that much. I think 3 times total. We should go socialize him more, bring him to dog friendly malls and parks. I hope it's not too late though since he's maturing very fast. Chowder is 7-8 months old, I hope this is not too late to train him and suppress his aggression, is it? Also, last night he bit my girlfriend's brother. My girlfriend's cousin and brother were both lying down on the same bed and chowder bit her brother. This is the same room where Chowder bit her dad. Reread Rory's Dads post and then reread it again. Why is Chowder not being taken out much? I think you stated maybe 3 times. He needs socialization. This is very important. It sounds like to me there is a lot of people and confusion in this area and Chowder is not comfortable with this. I think he is telling you this by his actions. Most chows like a relatively routine, calm predictable house. Commotion can most certainly aggrevate a chow. I would re-evaluate this. So, my first thought is i am going to spend a good deal of amount of time on this post, so if i ramble or get disjointed a bit, forgive me. 1st off, at 8 months it is not too late to train your dog and get him into proper behavior. But it is your job, and it is a job at this point. You are going to have to dedicate some time, patience, and self discipline. 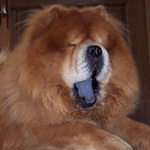 As an aside, research Cesar Milan and try to figure out how many chows he has actually worked with. I believe the answer is 1, and he did not fare very well. His tactics (bullying) do not generally work well with chows, so throw that advice out the window. There should be no need to leash a dog within the house. He should have free reign unless there is a safety issues (and the stairs qualify) or some other area where he is not wanted (use baby gates). A previous post supported NILF. Learn that technique and swear by it. Reward your dog when he does the right thing. Ask him to sit, when he does give him a treat (small pea sized bit of something he reacts to). Tell him to lie down, same thing. Teach him to walk on a leash at your side without any pull (hold that same treat at your knee, where you want his nose to be, and stop every 10 feet or so at the beginning, extending as he gets it). Work on recall even though its a tough skill for chows. Call him by name. When he comes reward him with affection and petting, maybe even a treat. Try playing with him. I have a female that loves balls and chew toys, my male could care less and prefers a good chest rub. He would never present his belly, but she loves it. Experiment and see what works. Decide who is his boss...now. Teach him to respect commands from that 1 person. Then let him understand who the other family members are that are acceptable to you without question (girlfriend, uncle, cousin, etc). This can be a large group, but should be those that are in "HIS" house most frequently. It is his nature to protect his house. Anyone else will need to be introduced, up front, as acceptable guests. Maybe its a terminology difference, but i am confused about a dog going out to do his business on a balcony. Perhaps that is just the egress to the yard, but consider 'supervising' these trips. If he is going to the door, then he is doing his job and telling you he needs to go out. My male was walked within the borders of our yard and will only go within a very small area. The female was a winter baby and we were a bit more lax on supervising, and now she will go everywhere. Not the best situation for summer use of the yard. Point being, everything is trainable. Socialize the dog. This is extremely important. Dog parks, as said, can be iffy. Consider pet stores that welcome leashed dogs. Biking or walking paths (you can get excercise too). Check to see if there are any dog shows coming up. My dogs both do conformation shows and this can be a great opportunity for your dog to get used to other dogs and plenty of people in an environment outside their home. If he is acceptable of grooming, try sending him off for a day at the doggy spa (if he isnt, you should work on that as well. Once that puppy fur is gone, he is going to need it). You dont need to dictate his every move, you just need to teach him what is acceptable. Reward for positive responses. He needs to learn what actions please you, and earn reward whether that be attention or a special treat. When behavior is unacceptable there has to be a consequence as well. If he snaps, give him a time out. Sequestor him away from you (if you are his master, or your girlfriend is it is her). Chows will crave attention and want to be around you. 10-15 minutes in a separate room will go good lengths. Consider a crate for the busy times at your home. If it's busy and he gets agitated, give him a safe zone. Don't use it as a punishment, but rather a space where noboby will bother him. Not the same as restricting him via leash. Help him feel comfortable by providing a toy and some water. If he hasnt been crated before, this can take some practice. Check on him frequently and talk to him and reassure that everything is ok. I totally agree with Rory's dad about Caesar Milan and his training ideas. Not anything I would ever do. Pat Miller is one of the best trainers in my opinion. http://www.peaceablepaws.com/pat-miller.php She has an excellent book "The Power of Positive Dog Training". Check out her website, it is full of information. If you can find a trainer in your area that uses positive methods to train I would suggest working with them. It is never too late to change these behaviors. Until then it is your responsibility to make sure that he is not in a situation that he can bite again. Thank you, I will follow your advice. He knows the command sit and down but I think it can be improved since he only follows when he sees a treat in my hand. Hi and thank you I really want to train Chowder and prevent this from happening again. We have visitors and some are kids and it would be really bad if this incident happens to them as well. I guess it does make sense for us to introduce the visitor to chowder before we let them come up, good advice, thanks! Lots of good advice coming from you, Thanks a lot! And Thank you also for clearing it up with Cesar Milan, yes i find his tactics a bit harsh and im glad to hear that I dont have to do some of those "bullying" methods to get chowder to obey. I have a question though: When you say teach him to respect commands from that ONE person, does that mean we (me and my girlfriend) can't both train him? The reason i asked is because there are days when i am not in their house so my girlfriend will be the one to do the necessary training. When I'm there, of course i want to be involved, make him obey and give him the treats myself. Does your statement mean that it is better that only one of us should train him? Thank you all for helping me with Chowder, I will post updates here and continue to train him! I am just glad that it is not too late to change his attitude. Rory may of meant one person just at first, and then gradually enter others. Maybe it would be too confusing to have everyone trying to establish leadership at once...I could see that, as just a means to get him to understand the concept and then introducing other family members as you go. My personal opinion is, all family members should be practicing NILIF and being leader at some point...exception would be a small child, which should be 100% supervised and intervened until they are old enough. Also, I think it's perhaps misunderstood what I mean by the leash and I personally was not referring to Cesar Milan. I did not mean to use it to control the dog literally, but as a means to just get a hold of the dog during dangerous moments and not putting yourself at risk, such as your dad getting bit for putting his hand in. Until Chowders is respecting you, you are under his mindset that HE is still the boss. It is only meant as a tool to get a hold and prevent a bite. The idea is safety until he is to the point you are confident you are in charge. Nothing more, nothing less. I am going through something similar with my own dog, he's had temperament issues from day one and it's not from lack of trying, he just really can't wrap his mind around strangers. In my case I have him with a professional, but will it turn him around...I don't know but I have to at least try. Point being, I know a little about the subject. Counter conditioning has been the only method [so far] that has been fairly effective for myself, people can get about 5-10 feet without him reacting negatively...any closer and I usually have to move him back until he is able to focus on me again. I have also excersized NILIF since he was 8 weeks, and I use mostly positive reinforcement but I am not afraid to give him a mild correction if need be. Most the time, it's not needed...chows are extremely smart, just stubborn and independence makes people think otherwise. Just to clarify...there is going to be a very distinct pack order, whether you realize it or not, Chowder will or there will continue to be issues. In his mind, he needs to be ONE persons dog. Who feeds the dog the majority of the time? That is going to be his first signal. Control the resources, and you become pack leader. With a chow, you will need to be able to control situations and responses without resorting to bullying. Who can have the firm voice and tell your dog to sit, stay, and knock it off without fear or self-doubt. That is what he is looking for and what you will need to determine. He will respect that sort of behavior and respond to it. A well trained chow should take command from any member of his family, but someone has to be the lead voice. If you tell him to sit and your uncle tells him to lie down, who is he going to listen to? He is going to choose his loyalty based on who provides better. If you give him his food, scratch his itch, or pull the thorn from between his toes, then you are his person. Other household members are family, and based on the same principal he will decide the pecking order. If someone in the house does absolutely nothing that benefits him, he will place himself above that person and decide to try and move up the order. I ubderstand the need to collar a dog. I currently have an intact male and an in-season female. They have trouble crossing paths. (She is 7 months old and certainly not ready for breeding. He is 2 years old and is...Based on some baby gates and collar control when switching/feeding, we have not even had an attempted mounting, but boy oh boy has it been a ton of fun). Both my chows have been around kids. I have a 6 year old nephew that pretends to be scared to death of dogs whenever he figures it will gain him attention. He screaches an ungodly amount and at an annoyingly high pitch. Both my dogs ignore him. It is practice and patience. Getting them out and around every situation you can think of. My current dogs are from the same breeder but have very different parents. I had two males prior to these and they reacted the same way to similar situations, its about conditioning. Goals: what is your worst case scenario but that you can still be okay with? My worst case scenario is crating my dogs everytime there is a stranger or children over and I'm okay with that. What would be ideal behaviour on Chowder's part? For me I want my dogs to accept strangers I approve of, but I want them to ignore guests and feel comfortable going into their crates to get away from guests. Think of your training goals and then break it down. If you want your dog to trust strangers or guests handling him he will first need to be okay with guests being near him, before that he will need to be okay with guests in the home, etc. Just because you have a goal in mind doesn't mean your dog will reach it, but it will help you be a better trainer. Training: dogs don't generalize well. What a dog learns in the home isn't necessarrily what he'll take with him when he goes outside or to dad's house, so train in differnt places. Its better to go too slow than to rush things and ask your dog to do things he isn't ready to do. Also, adding distraction, duration, or distance will make it harder for your dog. When your dog goes into fight or flight mode it will be difficult to redirect him so go slow with training him so that he doesn't get overwhelmed and backslide. Maintenance: have a plan for. When you aren't do training. If you have a guest who is afraid of dogs, a guest who doesn't listen to you and will try to. Chowder be? You can put him in an empty room with his most favorite toy ofdr put him in his crate with a yummy stuffed kong. My Chow Chow is smarter than your honor student. Sorry for the typos, its difficult to type and post from my phone. All in all you should consult with a behaviorist or dog trainer who uses positive reinforcement and not dominance theory (which is what Caesar Millan uses). The goal is always to build a relationship built on trust and respect. Not fear. You should also research calming signals in dogs. If I was on a laptop I would have more resources for you. I really hope that this dog is getting out for walks now - poor thing must have been stir-crazy - and his behaviour is under control.